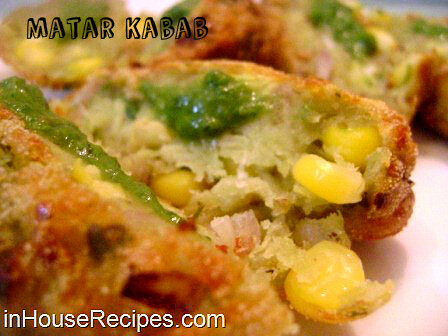 Matar Kabab Recipe will help you add a twist to your evening snacks. Corns and Peas are two of my favorite vegetables and i try to fit them into most of my preparations. This is one of the example that you would see where I have used both of them along with Potato make delicious Cutlets/Kababs. One thing that i would like to mention is that i have used raw potatoes while making these cutlets. You can also use them after boiling to make it more soft from the inner part. Peel the skin of the Potaoes and finely grate all of them into thin slices. Add Corns and Peas in a pressure cooker for boiling. Add enough Water to sub-merge the vegetables completely in the cooker. Cover the lid of the pressure cooker and keep the stove on high flame. Wait for a whistle to come. Add Corns and Peas in a pressure cooker for boiling. Add enough Water to sub-merge the vegetables completely in the cooker. Cover the lid of the pressure cooker and keep the stove on high flame. Wait for a whistle to come. After 1 whistle, don’t open the cooker till it has pressure in it. Let all the steam vanish on its own. Once done, open the lid. Drain excess water from Corn and Peas by keeping them in a sieve for 2 minutes. Once the water drains out, add them in a bowl and mash with light hands. This is just to mix the flavors of Corns and Peas. In another bowl, add grated Potatoes, mashed pea and corns, Salt, Red Chili flakes, Ginger and Green Chilies along with Oregano Seasoning, chopped Coriander Leaves, chopped Onion and Cornflour. Mix well. Add Semolina and mix well again. If you feel that mixture is a bit wet, you can add small quantity of Cornflour to absorb the excess water. After mixing all the ingredients, take small quantity of mixture in your palms and give it an oval or round shape. Coat the cutlet with one layer of Semolina, to make crispy cutlets. Heat Oil in a pan on high flame for about 3 minutes. Deep fry the cutlets on high flame until they achieve golden brown color from all the sides. Pour the Oil with the help of a spatula over cutlets for getting golden brown color on all the sides. Once they have achieved the golden brown color, take them out from the Oil. 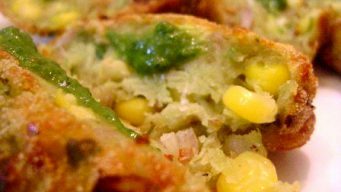 Spicy Pea Corn Cutlets are ready to eat. I hope you will like the recipe and share your valuable comments. Enjoy them with morning or evening Tea.